This is one of those venerable long-standing labels you often see in the supermarket but pay little attention to if you are a die hard pinotphile. Times have changed, however, and this winery is producing Russian River Valley Pinot Noir that is both distinctive and value-priced. 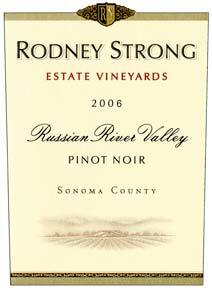 Rodney Strong, who founded the winery in 1959, was among the first modern wine pioneers in the Russian River Valley, planting his River East Vineyard in 1968. The winery was sold to Guinness and then bought by Tom Klein, a fourth generation California farmer, in 1989. In the mid 2000s, the winery planted about 600 acres of new vineyards in Sonoma County and more than half of the company's wines come from estate vineyards. In 2006 a portion of the winery was dedicated to producing reserve wines including a reserve Pinot Noir. The winery has the largest solar instillation in the county. In 2009 Rodney Strong became the first winery in Sonoma County to become carbon neutral and is a strong promoter of green farming and business practices. In 2007, Rodney Strong bought the Davis Bynum brand and launched Sonoma Vineyards. Rick Sayre celebrated 32 years as winemaker at Rodney Strong Vineyards in 2011. He was succeeded by young Justin Seidenfeld who works with consultant David Ramey. The Pinot Noir lineup includes an Estate Pinot Noir, a Reserve Russian River Valley Pinot Noir and a Reserve Jane's Vineyard Russian River Valley Pinot Noir. The winery is focusing on the higher-end of the winery's portfolio, primarily its reserve and single-vineyard wines. The tasting room on Old Redwood Highway is open daily. Winery tours are available. The wines are available on the website and distributed nationally.